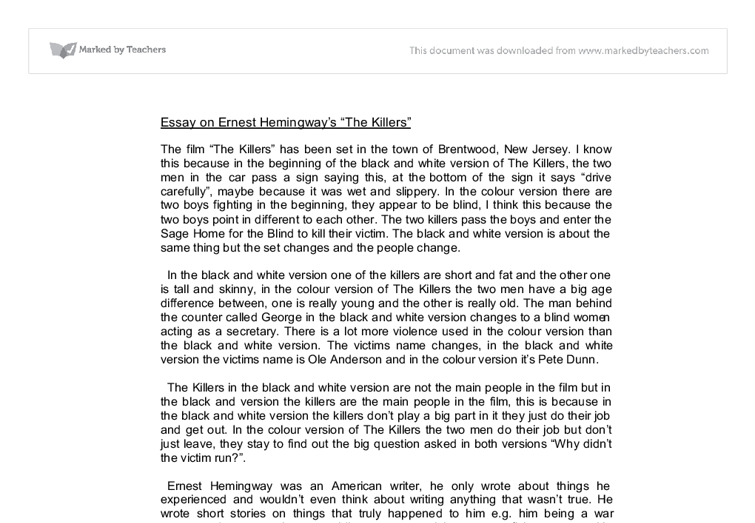 Essay on Ernest Hemingway's "The Killers" The film "The Killers" has been set in the town of Brentwood, New Jersey. I know this because in the beginning of the black and white version of The Killers, the two men in the car pass a sign saying this, at the bottom of the sign it says "drive carefully", maybe because it was wet and slippery. In the colour version there are two boys fighting in the beginning, they appear to be blind, I think this because the two boys point in different to each other. The two killers pass the boys and enter the Sage Home for the Blind to kill their victim. 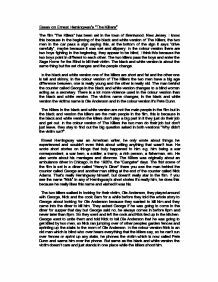 The black and white version is about the same thing but the set changes and the people change. In the black and white version one of the killers are short and fat and the other one is tall and skinny, in the colour version of The Killers the two men have a big age difference between, one is really young and the other is really old. ...read more. him being a war correspondent, a war hero, a soldier, a tramp, a rich person, a fisherman, etc. He also wrote about his marriages and divorces. The Killers was originally about an ambulance driver in Chicago, in the 1920's, the "Gangster" days. The first scene of the film is set in a diner called "Henry's Diner" there you see the man behind the counter called George and another man sitting at the end of the counter called Nick Adams. That's really Hemingway himself, but doesn't really star in the film. If you see the name "Nick" in any of Hemingway's short stories it's really him, he does this because he really likes this name and wished it was his. The two killers walked in looking for their victim, Ole Anderson, they played around with George, Nick and the cook Sam for a while before they told the whole story to George about looking for Ole Anderson because they wanted to kill him and they came into the diner to kill him. They asked George if he was going to come in the diner for supper that day but George said no, he always comes in before 6pm and never later than 6pm. ...read more. The director of the first ever film of "The Killers" was Robert Siodmak, he made his film in film noir. This means that the film was made in black and white, everything was dark throughout the film, there wasn't even any sound except the clicking of the clock in the diner. The sound started in the beginning and stopped as soon as you saw the killers enter the diner. The sound was big and loud, and it sounded like a horror movie, it had sounds of a silent movie. It was set to be in the night time, the angle of the camera was really as though you were standing there looking at everything that was happening from the top. The camera was filming from the ground to point at the ceiling, so it would look like the ceiling was getting narrower as it got to the end of the diner. Robert Siodmak was a German director and wanted everything to be perfect, so that's why he would draw pictures of every scene before filming it, he had the whole film set out in his head before he did anything. ?? ?? ?? ?? ...read more. Sam, the black cook, is afraid and just closes his eyes to the whole situation. He abides by the old adage, see no evil, hear no evil, speak no evil. When Nick announces his intentions to go warn Ole Anderson, Sam advises, "You better not have anything to do with it at all. The leopard also symbolizes "life-in-death," whereas Harry symbolizes "death-in-life" (Evans, 1961, p. 604). Harry was just quietly waiting for death to come. He was tired and angry and could no longer feel the pain of his illness (Hemingway, 1987, p.
It seems as if his will to live has diminished. Krebs suffered harmful psychological effects, but what about the others that survived the war. Some weren't even able to go back home after the war ended. Hemingway's short story, "Another Country" is about physically injured American soldiers in a hospital in Milan because of the war. "She would cook the things that Ralph liked (rich, thick stews, but not curry)..." She is trying to hard to impress Ralph that she is hurting her father and this is causing the conflict them all. Through "Chemistry", the narrator; being the little boy at time and his grandfather showed a lot of loyalty. When Nick says 'There's going to be a moon tonight'. I feel Nick is changing the subject and does not want to get too into the previous one because then Marjorie will find out how he feels and will be upset and I feel Nick feels that is too soon to reveal this information. it is even easier to resent the male for persuading her to do so. He uses manipulation and reverse psychology to coerce the female into believing abortion is the only reasonable option. As evident in his word choice, the male attempts to make light of a life or death decision.